Good morning. Two Christmas cards in a row, but is time for another card for the Christmas Card Club. It is due tomorrow but I have another card to post then. This time our hostess is GranMargaret and she asked us to use embossing on our cards. She left it to us whether we used "dry or wet embossing." I was greedy and did both. Most of the components for my card came from what was in a magazine I bought. I don't like saying "freebies" because at the price of magazines they are not exactly free! Although to be fair this was a great gift because it included two embossing folders, three stamps and backing papers too. Ribbon and pearl - from stash. The embossing folder is rectangular but I made it square as suggested in the magazine. 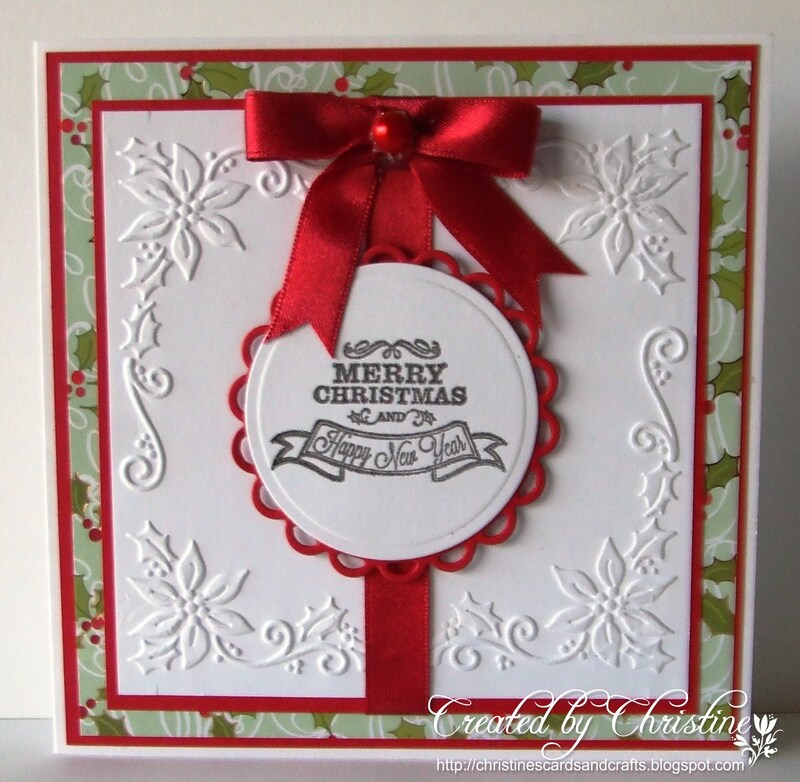 I stamped the sentiment with black ink and heat embossed with iridescent embossing powder. It doesn't show at all in the picture but when the light catches it it looks lovely. Hope this finds you well. We had a glorious summer day yesterday! I'll never understand our British weather so it's best not to try! A very pretty card. love the traditional colours. Love, love, love, your fantastic card, fabulous design. Very pretty, love the traditional colours and background paper. what a wonderful Christmas card. Love the fab design of this, and that wonderful embossing. You are quite right about the freebie bit, but some times the gifts are good value for a magazine that is full of adverts. I too only go for ones that I think are good value. So pretty - who wouldn't want to receive this gorgeous card! Terrific card. The embossing is lovely and so crisp. I'm all for using freebies when I can. Your embossing folder is gorgeous and love your colours., Hugs Mrs A.